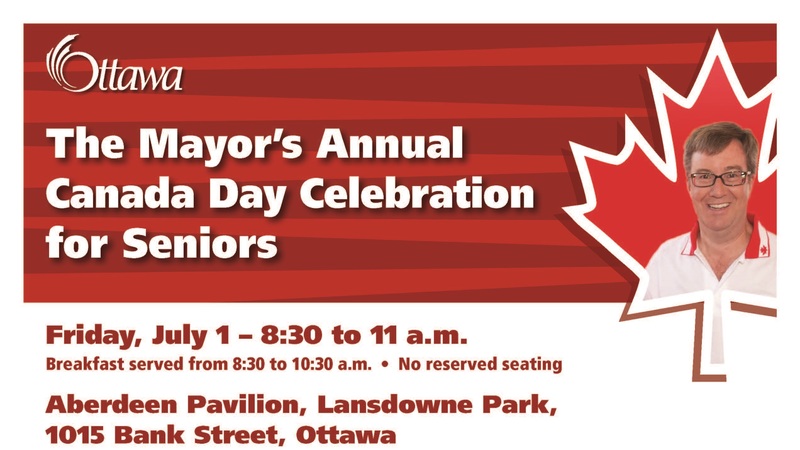 I am hosting my Annual Canada Day Celebration for Seniors on Friday, July 1 from 8:30 to 11 a.m. at the Aberdeen Pavilion, Lansdowne Park. 1015 Bank Street, Ottawa. 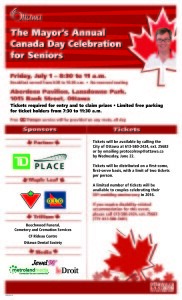 Tickets are required for entry and to claim prizes. There is limited free parking for ticket holders from 7:30 to 11:30 a.m. Tickets are available now by calling the City of Ottawa at 613-580-2424, ext. 25683 or by emailing protocolrsvp@ottawa.ca by Wednesday, June 22. They will be distributed on a first-come, first-serve basis, with a limit of two tickets per person. A limited number of tickets will be available to couples celebrating their 50th wedding anniversary in 2016. Click on the image below to see the poster and additional information.